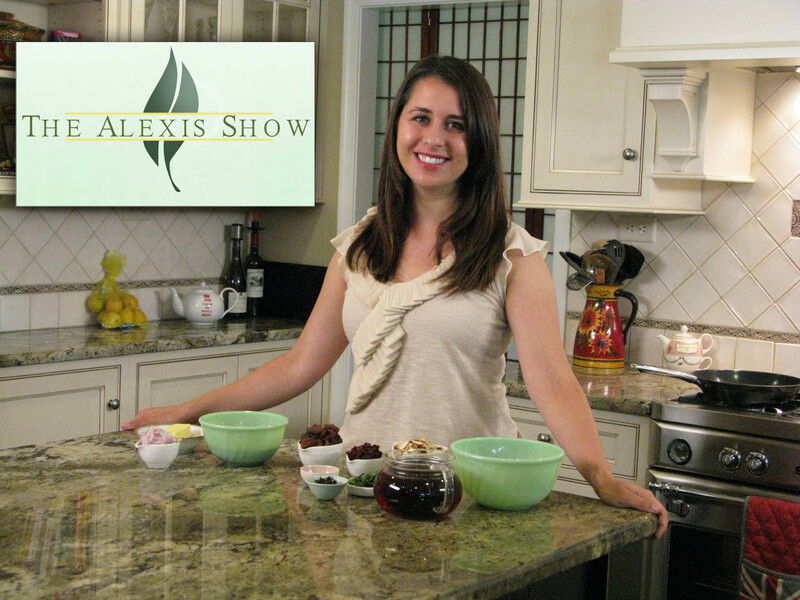 The Alexis Show features original tea-infused recipes created by tea consultant and writer of teaspoons & petals, Alexis Siemons. With recipes such as Lapsang Souchong Campfire Ice Cream Sandwiches, Pu-erh Chicken & Mushroom Kabobs, Green Mint Tea Gazpacho, Earl Grey Aioli and Keemum Rose Black Tea Panna Cotta – there’s a mix of sweet and savory steeped bites to enjoy all summer long. Check back every week for full-length episodes (starting next week). Can’t wait? 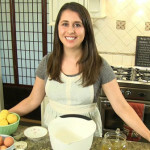 Treat yourself to four teaser episodes of simple steeped recipes for quick and easy tea-infused treats! 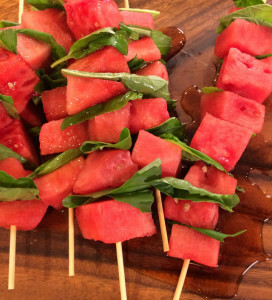 Basil may be a savory star, but it’s earthy and subtle peppery flavors balance the luscious watermelon and sweet, malty Assam syrup. Often a blend of Assam and Nilgiri black tea fragranced with bergamot oil, Earl Grey tea begs to be mixed with delightfully creamy dairy. Needless to say, this earl grey infused butter was a natural kitchen combination that is best served slathered on toast. Be adventurous and use it to roast a chicken/summer vegetables, to fry an egg for a breakfast sandwich, or simply melt it over popcorn. If your sweet tooth is calling, bake it into your favorite treat that calls for butter. Add a twist to your favorite iced tea by using herbs from your garden! Look beyond the obvious choice of mint and try something new, such as basil, tarragon, thyme, or rosemary. Pu-erh tea, known for its very rich, woodsy and earthy flavor, can often have aromas and tastes of mushrooms, tobacco smoke and even hints of leather, all depending upon if its cooked or raw and how long it’s been aged. The deep, earthy notes add a complexity that sings when mixed with umami notes of soy sauce, toasted sesame oil and other ingredients in the marinade. 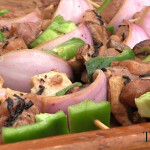 Swap chicken with tofu or sweet carrots for a vegetarian skewer. Infused with a traditional blend of Chinese gunpowder green tea and dried mint, this chilled summer soup features a tea concentrate and tea steeped grapeseed oil. The tea balances the bundle of bright green ingredients rather than being the star of the show. Pair a cup of the soup with a glass of iced green mint tea for a simply refreshing meal. This episode features a behind-the-scenes look at how The Franklin Fountain in Philadelphia makes their green tea ice cream and what inspired them to add the flavor the menu. Lapsang Souchong is a black tea from China known for its smoky flavor and aroma. The ice cream sandwich cookies are infused with a lapsang souchong butter to capture a subtle smoky campfire note that’s balanced by dark cocoa. Layer cookies with marshmallow spread and vanilla ice cream for a whimsical take on s’mores and ice cream. Tea and liquor have become fast friends on drink menus that blend part high tea and part happy hour all into one. While some tea infused cocktails might include a tea simple syrup or chilled tea, the steeped cocktails at Vernick are handcrafted with spirits that have been infused with the tea leaves for a pure flavor. Vincent Stipo, head Bartender and Beverage Manager at Vernick, infuses cognac with a rooibos blended with orange peel and safflowers for his cocktail, The Field Gun Envy. Rooibos, a red bush grown in South Africa, is known for its depth of earthy flavor (without the caffeine) and can stand up to strong flavors-like cognac. Citrus flavors abound from the lemon and Earl Grey tea, complimented by the nutty taste of the roasted garlic, creating a rich, creamy spread, good either as a sandwich spread or veggie dip. Oriental Beauty oolong, traditionally referred to as dong fang mei ren oolong, is grown and harvested in Taiwan and known for its rich honey and stone fruit aromas/flavors. To play upon the stone fruit notes in the tea, we’re infusing it with dried apricots and cherries to create a broth to cook the couscous (and to rehydrate the fruit to mix in the dish). Butter, shallots, salt and pepper balance the dish with savory notes, while just a splash of balsamic vinegar and fresh herbs brighten every bite. Best of all, you can make this dish ahead of time and serve it at room temperature. Tea & Cheese Pairings at Di Bruno Bros. Afternoon tea and happy hour have found common ground by swapping wine for tea, and delicate sandwiches for wedges of cheese. Consider tea and cheese pairings a deconstructed tea latte. Creamy notes mingle with the steeped sips to create an indulgent sensation that’s quite comforting. Hoping to uncover perfect pairings, Rocco Rainone (certified cheese professional at Di Bruno Brothers) invited me into the historic Italian Market shop to share fall steeps that captured the stone-fruit, cinnamon, toasted, roasted, earthy, forest sensations, aromas and flavors of fall. We nibbled our way through wedges of cheese until we found the ultimate creamy companions that stood up to and always enhanced the brewed tea, quieting tannins, highlighting sweetness or seeking out notes deep within the tea that were once hidden. Take a peek at the video to learn more about our edible adventures. An Italian cooked cream dessert is given a tea twist by infusing it with Rose & Keemun black tea. If you can’t find that particular blend, purchase Keemun black tea and blend with dried rose petals or other dried flowers (note: rose offers more intense, perfumed floral flavor in comparison to other dried flowers). The Chinese Keemun black tea offers toasty, sweetly smoky notes with gentle fruit flavors and an essence of subtle dark cocoa and brown sugar. The black tea is then scented with rose and blended with dried rose petals that add a sweet, soft and deeply floral quality that sends your senses to a rose garden. When infused in the cream, the panna cotta tastes of a faint bouquet of roses and toasty complex depth from the Keemun black tea. If pistachios and edible flowers aren’t available for garnish, opt for almonds or hazelnuts and top with fresh berries. Thanks for watching this season of The Alexis Show, only on The Daily Tea. Want to see more episodes in the future? Let us know in the comments below! Alexis Siemons is a tea consultant and writer living in Philadelphia. She is certified in the Foundations of Tea (Level 1 & 2) by the Specialty Tea Institute, a division of the Tea Association of the USA. As a tea enthusiast, she writes about her steeped adventures on her website and blog, teaspoons & petals, teaches a series of culinary tea classes, and develops tea-infused recipes for restaurants. She also consults with tea companies, developing tea programs and creative marketing strategies. Her recipes and stories have been published in Anthology Magazine, Grid Magazine, Philadelphia Magazine, Kinfolk Magazine, Remedy Quarterly, Women's Health Magazine and Design*Sponge.